September 25, 2018 - October isNational Breast Cancer Awareness Month. 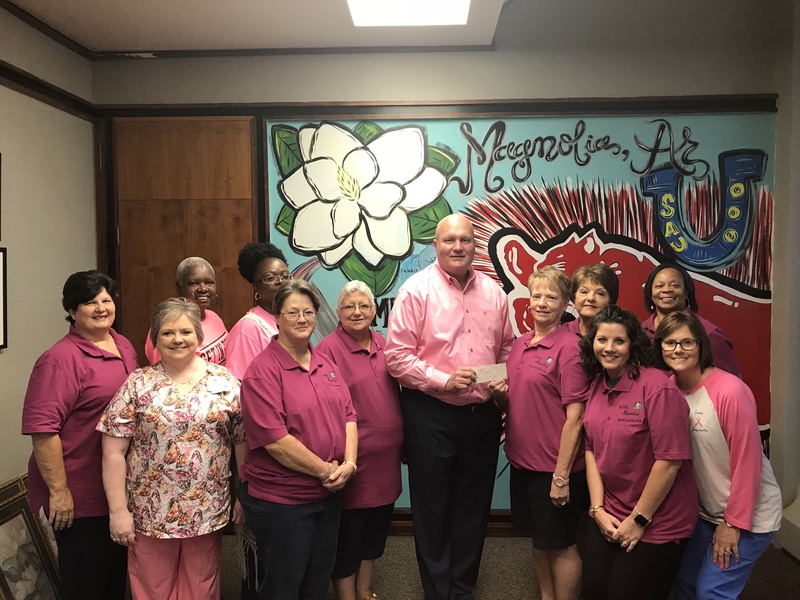 The Steel Magnolias, a local breast cancer awareness and support group,announces that September 30th through October 6th is“Pink Week” to bring about awareness of the importance of mammography. Mayor Vann recently donated tothe local group in support of their endeavors to find a cure for breastcancer. “I urge you to give if you canbut if not, show your support to all the women who have fought, are fighting orlost their fight to breast cancer by wearing pink during the month of October,”stated Mayor Vann. The Steel Magnolias invite you to attend the SAU “Light forthe Fight” ceremony on October 1st at 6:30 p.m. at the fountain atBlanchard Hall located on the SAU Campus. They also want to encourage anyone that is a survivor or currentlyfighting breast cancer to join them at their meeting on October 9that 5:50 p.m. at 707 E. Main (next to Oil & Lube Express). Pictured Back left toright: Debbie Martin, Verna Carter, Charlotte Davis, Regina Minor, Mayor Vann,Barbara Hall, Bonnie Zorsch, Veronica Gilbert; Front left to right: LisaGoodsen, Francine Cloud, Leslie Boyd & Julie Eddy.